We used to call Simon Fraser University ‘the hill’. As in, “Are you going up the hill today?” Maybe this inside joke eased the pain, especially for people who lived/ worked/ studied at SFU, of knowing that a freak snowstorm in May could see bus service suspended and have you walking down a mountain if you want to get off the mountain before midnight. Despite this, I often biked to get there. It was a short and nasty climb at the end but the ride through Burnaby Mountain Park in the early morning fog was always beautiful. Since a friend recently began riding up the hill, I dug out this cartoon from 2001 for her. 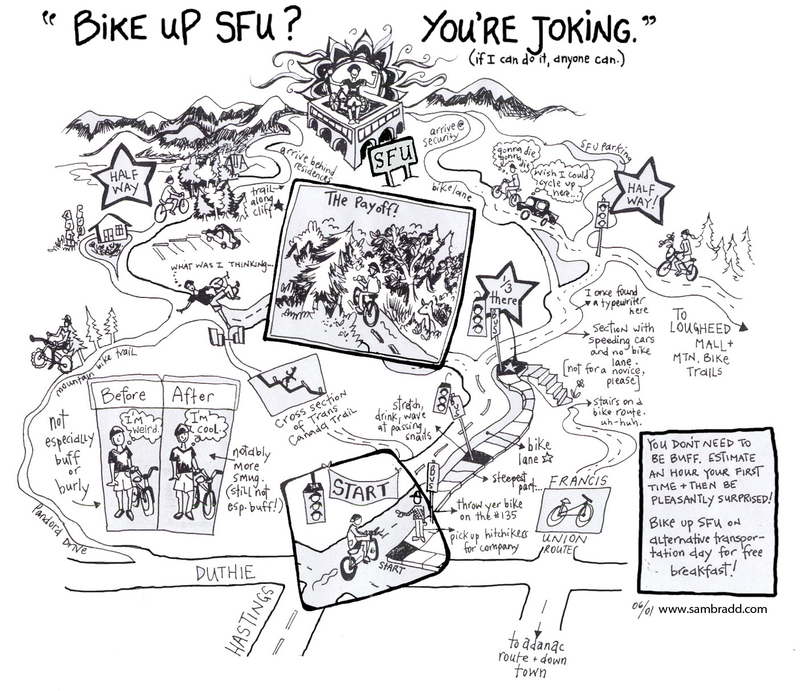 I made it ten years ago for Antithesis Magazine, back in the days when SFU had “Alternative Transportation Day”. And speaking of Antithesis, I see it’s morphed from publishing into training students in media and design skills. These skills are what first attracted me to work with the Simon Fraser Public Interest Research Group in the late 1990s: I have fond memories of learning how to do magazine layout (scotch tape, anyone? ), graphic design (on QuarkExpress) and illustration skills (there might have been some collage work in there…) while working on this DIY magazine. Now I’m biking to UBC. It’s better, but there’s still a hill no matter what.